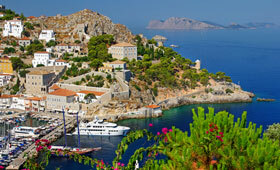 Join Star Flyer on this 7-night cruise from Athens exploring the beautiful Turkish Coast and idyllic Greek Islands. Explore the rich history of Rhodes island before reaching Bodrum which was once the site of one of the Seven Wonders of the Ancient World. Cruise through the unspoilt stretch of the Dalyan River, past hot sulphur pools and quiet villages to the volcanic island of Santorini. Stroll along streets lined with white-stone houses and blue roofs, or admire the fantastic views from the cliff tops. Sail to the traditional Greek island of Hydra, the final stop before returning to Athens, concluding this memorable sailing cruise around the Southern Cyclades. The stunning island of Rhodes has a rich and varied history. Lindos in the south of the Island is home to the ancient Acropolis and one of the best beaches on the island, whilst the medieval capital, Rhodes Town, offers something for sightseers and shoppers alike. Bodrum was the site of the Mausoleum of Halikarnassus, one of the Seven Wonders of the Ancient World. The medieval castle of St Peter, now a museum, stands guard over the harbour. There are long, sandy beaches in Bodrum, and one of the best is along the peninsula at Torba, backed by pines and olive groves. A wide variety of excellent restaurants in and around the town offer menus to suit every taste. Dalyan River is a beautiful and unspoilt waterway stretching from the Mediterranean to Lake Koycegiz. Peaceful villages, the Lycian rock tombs, hot sulphur pools and a breeding ground for the Caretta Caretta turtle can all be seen on a journey up-river. Dalyan town has shops, and a good selection of traditional restaurants. The rocky island of Santorini is loved for its fantastic views from the cliff-top towns of Fira and Oia. The Archaeology Museum displays finds from the excavation of Akrotiri, and in Fira, perhaps visit the church of Ag Mina, the much-photographed symbol of Santorini. This interesting island has no roads or vehicles, a wild and sparsely populated interior and magnificent mansions, some open to visitors, and built by shipowners in the 18th century. Walk along steep donkey trails, visit one of the many monasteries, and soak in the atmosphere which attracts artists to make their homes here.